A new patch for StarCraft II: Heart of the Swarm will introduce a progression system to the popular real-time strategy game. Starting "soon" (which in Blizzard language usually means "not soon"), Heart of the Swarm beta players will be able to gain experience points by playing both competitive and custom matches. These experience points—which will be tracked for each race you play—will allow you to level up and buy portraits for your player account. Each level you earn awards either a decal or a portrait for the race that you're playing. These rewards get more and more epic as you progress in a race. The rewards will be different for each race, so truly dedicated players can push themselves to great heights for each of the three races. 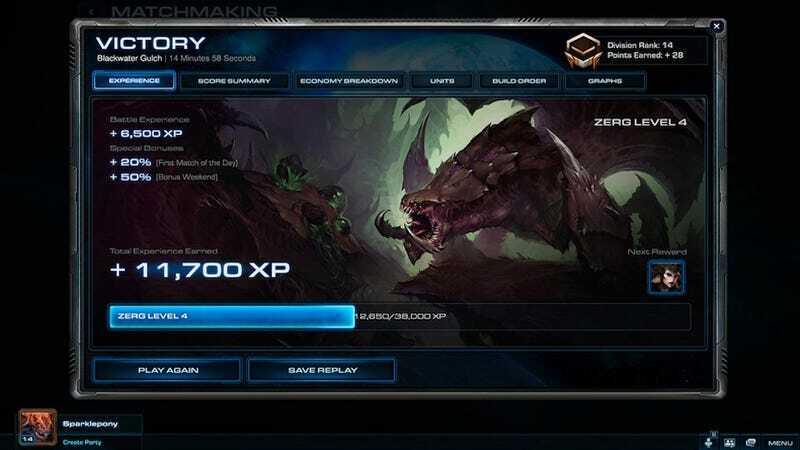 After the next major beta patch, testers can try this system and start earning XP in the beta. We're planning on making adjustments over time, so it's likely that XP resets will happen during beta. We're going to pay very close attention to the leveling curve and the fun factor of this system, so it's important that we have a lot of playtest results to work with. We'll give beta testers notice in advance of resetting the system so testers can help us try different methods of gaining XP. They're also considering bonus experience weekends, "bonus XP for your first win of the day," and other catchy techniques to get you to keep playing.